This is just a really quick note to let folks know that yesterday on my Virtacore vCloud Express I happened to determine that the Organization vDC I was in was running Fast Provisioning. Not hard to tell when things are deployed very fast actually. I inquired and because I was an early Beta tester it had been enabled, but new accounts are not. Once they disabled it I was stuck trying to figure out how to convert them. In my home lab as a system administrator this is easy since you can “Consolidate”. Notice below the “consolidate” is not an option. However as a normal Organization Administrator you can still do it pretty easily. Either way you need to shut the vApp down first. Once you have them shut down you do not have the consolidate function. 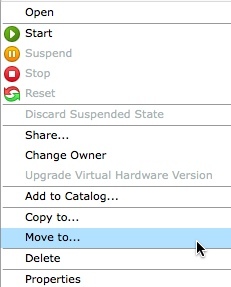 However you can select “Move To”, and in the next field simply select the SAME Organization VDC. In the case of a vCloud Express Provider it is the only one available. If you have multiple Organization VDC’s then just select the same one you’re vApp is currently in. I was pleasantly surprosed that this worked and kept all the IP information on the vApp. I had never tried this as an Org admin since in my lab I am always a system administrator. This little trick works pretty well to handle the conversion task if you have nothing more than organization admin level access and want to convert from fast provisioned to standard, provided it was disabled on the Organization vDC. Note: if Fast Provisioning is still enabled it can only be one on a per vApp basis by the system admin. If you do the “Move To” you will just get another linked clone copy! This also does require accessing the standard vCloud Director Portal if the provider’s custom portal does not have the functionality exposed using the API.